As the grandaughter of Jewish immigrants from Eastern Europe, many pieces of wisdom about how to survive – and thrive – in a sometimes hostile world were imparted to me as I grew up. Some of this wisdom blended in to the background like the Yiddish that my parents sometimes spoke to each other when they didn’t want us to understand. The meaning’s clear; don’t get too attached to the place you call home as there’s always a chance you may have to run away with only a few belongings to your name. I wonder what the suitcase would contain … a change of clothes I suppose, some essential toiletries, a few bits of food perhaps, what do you pack to keep you safe when you know you may never see home again? In my imagination it’s brown leather, a little battered and covered with labels from places like Basel and Paris, Antwerp and Prague. Of course nowadays the suitcase is more mundane and functional, likely to be a small wheelie which complies with airline weight restrictions. Should it be a carry on or shall I check it in? But either way – don’t get attached to houses- they’re just bricks and mortar and don’t get attached to things. Things are replaceable. People are not. And yet as I write these blogs each week, focus on the things that give me pleasure, their meaning in my life, I notice, despite the warnings ingrained in my soul, that I have become attached. To home. To the idea of home. To certain things which do mean something like a precious bowl that a friend once gave me or photos of dear ones. And I wonder if that’s so bad; that the pain of possible detachment or parting can sit alongside attachment and love. Can we know that one day we may well have to leave this home or abandon cherished items while at the same time commit wholeheartedly to the love of life and the expression of our desire to create, or even re-create, home in our surroundings? I watched a video this week and it explained that the Humanist view of the meaning of life is that there is no afterlife. This is it, Humanists say – we have one beautiful life so we better make the best of it and be present while we are here. And, they say, there’s no need to be sad or feel we’re just going to disappear in to the ether because our genes will live on in our descendants. In our living room I have two exquisite pieces of furniture that I love and which belonged to my grandmother. 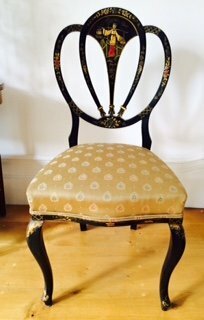 A side table and chair that once sat in her living room, part of a set of chinoiserie furniture that was popular in the twenties. Black lacquer, intricately decorated with scenes of pastoral life in China or Japan. I used to study the little pictures as a child and wonder about all those dainty people with their interesting clothes and parasols and bridges and delicate trees and flowers. When I look at those pretty pieces now, I’m back in her living room, dimly lit and slightly mysterious although not at all frightening. On the contrary, it was a fun, safe place with the big, square television at one end where we watched episodes of Doctor Who and hid behind the sofa when the Daleks came on. I hear Grandma’s voice, her funny accent from far away. She becomes present to me, she lives on not only in me and my children but also in her distinctive furniture that was all the rage and maybe a sign to others of how far she’d travelled. Although she was elderly I remember her joyful laugh and I also see her tears when she was in hospital near the end of her life. I can hold both of those happy and sad memories all at once and I can take simple pleasure in her choice of furniture as I pack my suitcase and contemplate a journey to the East, a source of inspiration for the creation of Grandma’s fashionable new home in a foreign land. I love the image of you studying the images and was so happy to see a photo of the chair! I am with you in that memory.